Citation: Waseem D, Latief M, Sofi N, Dar I, Khan Q, et al. Dress Syndrome: A Review and Update. Skin Dis Skin Care. 2016, 1:1. Copyright: © 2016 Waseem D, et al. This is an open-access article distributed under the terms of the Creative Commons Attribution License, which permits unrestricted use, distribution, and reproduction in any medium, provided the original author and source are credited. Drug Reaction with Eosinophilia And Systemic Symptom Syndrome [DRESS] is a hypersensitivity drug reaction, most frequently associated with antiepileptic drugs (AEDs), characterized by skin rash, fever, pharyngitis, lymphadenopathy, and visceral organ involvement, typically presenting within 8 weeks of initiation of therapy. Management of DRESS syndrome involves prompt withdrawal of the offending drug and use of systemic corticosteroids. Bocquet  in 1996 described a drug induced condition characterized by an extensive rash, fever, lymphadenopathy, hematologic abnormalities, hepatitis, and involvement of the kidneys, lungs, heart, or pancreas and termed it Drug Reaction with Eosinophila and Systemic Symptoms (DRESS) [2,3]. The incidence of DRESS has been estimated to be between 1 in 1,000 and 1 in 10,000 drug exposures. DRESS syndrome is more common in adults. Mortality is very high and is of the order of 10-20%. Liver failure is the most common cause of death. 1. A genetic component that alters immune response. 2. A triggering factor mostly a viral infection. 3. Defect in drug metabolism resulting in failure to eliminate drug intermediates. Recent studies have suggested a close relationship between Herpes Viruses and DRESS syndrome . Although HHV 6 was the initial virus proposed as a causative agent in DRESS syndrome, recent studies have shown a sequential involvement of many herpes viruses extended over a period of time . The cascade of viral reactivation is initiated by EBV or HHV-6 and extends over a period, followed by HHV-7 reactivation and eventually CMV proliferation. In support of this hypothesis, herpes virus genome can be detected at high frequency coincident with the clinical symptoms. However sequential reactivations of these viruses were not always associated with evidence of overt clinical symptoms. Aromatic anticonvulsants such as carbamazepine, phenytoin and phenobarbital are metabolized by the hepatic cytochrome CYP450 enzymes and converted into toxic arene oxides that are normally enzymatically converted to non-toxic metabolites by epoxide hydroxylase or gluthatione transferase. In cases of defective or deficient epoxide hydroxylase, arene oxides can accumulate and cause direct cellular toxicity or immune response. Moling et al. successfully treated an adult with sulfasalazine-related DRESS using a combination of prednisone, N-acetylcysteine to neutralize reactive metabolites and reduce oxidative stress, and valganciclovir to reduce the effects of HHV-6 reactivation and provided evidence for the above three proposed theories DRESS syndrome. Microscopically, there may be superficial perivascular lymphocytic infiltrates and some extravasated erythrocytes or eosionophils. Sometimes there is a band-like infiltrate with atypical lymphocytes simulating epidermotropism mycosis fungoides. The onset of symptoms is often delayed, occurring 2-6 weeks after drug initiation. Symptoms may however occur early if drug is read ministered. Fever and rash are the commonest symptoms. The temperature ranges from 38 and 40 with spikes that usually generate a concern of an underlying infection. The spiking fever often persists even for weeks despite discontinuation of the offending drugs. The cutaneous eruption consists of a morbilliform rash initially affecting the face, upper trunk and upper extremities with subsequent progression to the lower extremities (Figure 1) .Over time the rash becomes purplish on the lower limbs and the result is scaling. Lymphadenopathy is common and may occur in as many as 70% patients. Figure 1: Rash over trunk in a patient of DRESS Syndrome. Liver is one of the most common organs involved in DRESS Syndrome and liver failure is the most common cause of death in these patients . Liver abnormalities are in the form of hepatomegaly, transaminitis, hepatitis or frank hepatic failure . Renal involvement may occur in 11% patients, mostly seen associated with allopurinol. There may be a rise in urea or creatinine or appearance of albumin in urine. Sometimes eosinophils may be seen in urine . Various pulmonary abnormalities, although rare, seen in DRESS include acute interstitial pneumonitis, lymphocytic interstitial pneumonia and adult respiratory distress syndrome (ARDS) and spontaneous air leak syndrome (pneumothorax and pneumomediastinum) . Neurological complications include meningitis, brain edema, cranial nerve palsies and seizures . Myocarditis is a fatal and under-recognized manifestation of DRESS, which may occur long after the initial diagnosis. Leukocytosis, eosinophilia (30% of cases) and atypical lymphocytes similar to mononucleosis are the most common haematological abnormalities. Atypical lymphocytes predominantly consist of activated CD8+ T cells. Also a dramatic decrease in serum IgG, IgA, and IgM levels is typically observed at onset and the lowest IgG, IgA, or IgM levels are usually detected several days after withdrawal of the offending drug. Sarita et al. reported a patient who developed DRESS syndrome without rash following administration of salazopyrin. In this patient, the presence of eosinophilia, the temporal relationship of the symptoms with the initiation of treatment with salazopyrin, and the marked improvement on withdrawal of the drug along with the administration of systemic corticosteroids, were features consistent with the diagnosis of DRESS. Antibiotics (minocycline, linezolid, doxycycline, piperacillintazobactam) and antivirals (abacavir, telaprevir, zalcitabine). Cases have also been reported with allopurinol, calcium channel blockers, ranitidine, azathioprine, dobutamine, pyrazinamide etc. Timely diagnosis is paramount to the treatment of DRESS Syndrome as is immediate withdraw of the culprit drug. In cases in which the culprit drug is not obvious, clinicians must use their clinical judgment to select which medication to discontinue [14,15]. They may also utilize patch or lymphocyte transformation tests to aid in identification when appropriate. Patients with DRESS syndrome should be managed in an intensive care or burn unit for appropriate care and infection control. In addition, appropriate specialists should be consulted based on the affected organ systems. Antipyretics should be prescribed to reduce the effect of fever. Skin care may include the use of topical steroids to alleviate symptoms . Systemic steroids have been used in the management of DRESS syndrome and have shown gratifying results in individual case reports and in some cases relapses have occurred after withdrawal or tapering of steroids suggesting their role in treatment. However no randomised clinical trials exist to demonstrate the efficacy of systemic steroids in the management of DRESS syndrome. Also dosage, duration of treatment and situations where steroids should be used are not clearly defined. Several authors suggest their use only in severe systemic involvement only. In fact several case reports . The French Society of Dermatology recommends the use of systemic corticosteroids at a dose equivalent to 1 mg/kg/day of prednisone in patients with any sign of severity including: transaminases greater than five times normal, renal involvement, pneumonia, hemophagocytosis, or cardiac involvement. They further recommend the use of IVIG at a dose of 2 g/kg over five days for a patient with life-threatening signs such as renal failure or respiratory failure. In addition, they propose the use of steroids in combination with ganciclovir in patients with signs of severity and confirmation of a major viral reactivation of HHV-6 [18-20]. Several case reports have also demonstrated the beneficial effects of concomitant use of N acetyl Cysteine given its drug detoxifying capabilities. Moling et al. used NAC in a patient of acetaminophen induced hepatotoxicity who was later on proved to have DRESS syndrome. Thomas et al. reported a patient of lamotrigine induced DRESS syndrome who showed dramatic, sustained clinical response to therapeutic plasma exchange after conventional treatment (steroids) failed. Also Shaughnessy et al. reported successful plasmapheresis and rituximab treatment for minocycline-induced myocarditis associated with the DRESS syndrome. Two sets of diagnostic criteria exist for the diagnosis of DRESS Syndrome. 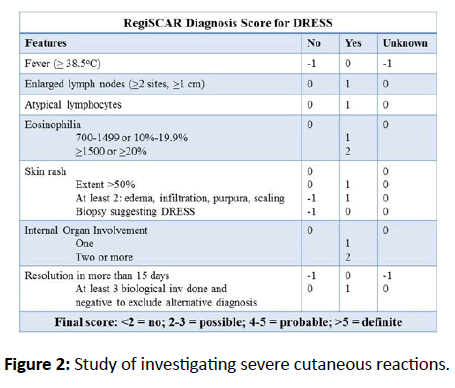 RegiSCAR program was developed by an international study group investigating severe cutaneous reactions (SCAR) (Figure 2). Figure 2: Study of investigating severe cutaneous reactions. A Japanese consensus group has developed a second set of criteria for DRESS (Figure 3). Figure 3: A second set of criteria for DRESS. DRESS syndrome is a serious drug reaction with high mortality due to systemic involvement. Early diagnosis is essential. Although guidelines for appropriate management do not exist, steroids are routinely used in its management. Use of other modalities like N Acetyl Cysteine, plasmapheresis and rituximab has also been reported. Bocquet H, Boagot M, Roujeau JC (1996) Drug-induced pseudolymphoma and drug hypersensitivity (Drug rash with eosinophilia and systemic symptoms: DRESS). SemCutan Med Surg 1: 250-257. Shear NH, Spielberg SP (1988) Anticonvulsant hypersensitivity syndrome. In vitro assesment of risk. J Clin Invest 82: 1826-1832. Fiszenson-Albala F, Auzerie V, Mahe E (2003) A 6-month prospective survey of cutaneous drug reactions in a hospital setting. Br J Dermatol 149: 1018-22. Shiohara T, Inaoka M, Kano Y (2006) Drug-induced hypersensitivity syndrome (DIHS a reaction induced by a complex interplay among herpesviruses and anti-drug immune responses. AllergolInt 55: 1-8. Kano Y, Shiohara T (2004) Sequential reactivation of herpesvirus in durg-induded hypersensitivity syndrome. ActaDerm. Venereol 84: 484-485. Moling O, Tappeiner L, Piccin A (2012) Treatment of DIHS/DRESS syndrome with combined N-acetylcysteine, prednisone, and valganciclovir - a hypothesis. Med SciMonit 18: 57-62. Criado PR, Criado RF, Vasconcellos C, Pegas JR, Cera PC (2004) Drug-induced hypersensitivity syndrome due to anticonvulsants in a two-year-old boy. J Dermatol 3112: 1009-1013. Kano Y, Ishida T, Hirahara K, Shiohara T (2010) Visceral involvements and long-term sequelae in drug-induced hypersensitivity syndrome. Med Clin N Am 94: 743-759. Lupton GP, Odon RB (1979) The allopurinol hypersensitivity syndrome. J. Am. Acad. Dermatol 1: 365-374. Giri PP, Roy S, Bhattyacharya S, Pal P, Dhar S (2011) DRESS Syndrome with sepsis, Acute Respiratory Distress Syndrome and Pneumomedisatinum Indian Journal of Dermatology 56: 763-765. Lefebvre N, Forestier E, Farhi D (2007) Minocycline-induced hypersensitivity syndrome presenting with meningitis and brain edema: a case report. Journal of Medical Case Reports 1: 22. Bourgeois, Greg P (2004) A review of DRESS-associated myocarditis. Journal of the American Academy of Dermatology 66: 229-236. Sasidharanpillai S, Binitha MP, Manikath N, Janardhanan AK (2015) Drug reaction with eosinophilia and systemic symptoms without skin rash. Indian Journal of Pharmacology. 47: 687-689. Barbaud A, ReichertPenetrat S, Trechot P (1998) The use of skin testing in the investigation of cutaneous adverse drug reactions. Br J Dermatol 139: 49-58. Möbs C, Pfützner W (2014) Cellular in vitro diagnosis of adverse drug reactions. Allergo Journal International 23: 164-171. Afaf O, Wanis I, Izzat K, Nabeel A, Rania E (2014) Sudden Worsening of DRESS Syndrome on Tapering Steroid Dose with Dramatic Improvement on N-acetylcysteine and Steroid Dose Escalation. Ibnosina J Med BS 6: 101-105. Descamps V, Ben-Saïd B (2010) Management of drug reaction with eosinophilia and systemic symptoms (DRESS). Ann DermatolVenereol 137: 703-708. Redondo P, De Felipe I, De la Pena A, Aramendia JM, Vanaclocha V (1997) Drug-induced hypersensitivity syndrome and toxic epidermal necrolysis: Treatment with N-acetylcysteine. Br J Dermatol 136: 645-646. Simonart T, Tugendhaft P, Vereecken P, De Dobbeleer G, Heenen M (1998) Hazards of therapy with high doses of N-acetylcysteine for anticonvulsant-induced hypersensitivity syndrome. Br J Dermatol 138: 553. Vélez A, Moreno JC (2002) Toxic epidermal necrolysis treated with N-acetylcysteine. J Am AcadDermatol 46: 469-470. Moling O, Tappeiner L, Piccin A, Pagani E, Rossi P (2012) Treatment of DIHS/DRESS syndrome with combined N-acetylcysteine, prednisone and valganciclovir-a hypothesis. Med SciMonit 18: 57-62. Thomas A, Edward I, Yara P, Daniel D, David P, et al. (2013) Severe DRESS Syndrome Managed With Therapeutic Plasma Exchange. Pediatrics 131: 3. Shaughnessy K, Bouchard S, Mohr M, Herre J, Salkey K (2010) Minocycline-induced drug reaction with eosinophilia and systemic symptoms (DRESS) syndrome with persistent myocarditis. J Am AcadDermatol 62: 315-318.